I've always preferred carrying a bag rather than a bulky backpack. I use this bag to carry all my school stuff in, but I also have this backpack on hand in case I need to bring my books to class for some reason (usually professors don't expect you to bring your books to class everyday, I feel, but sometimes they'll ask you to and those can be heavy so a backpack might be best for that). I really am so glad I got a Longchamp bag though. I've had it for over a year and it honestly looks brand new! I honestly feel like I need my planner with me at all times. I found this year's planner at TJ Maxx, and it's from the brand Eccolo. I'm honestly obsessed with it and I would recommend their planners to anyone! I just discovered their website and learned that they have tons of cute stationary, journals, and even home decor. Last year, I used this planner and absolutely loved it. You can find so many cute planners out there and I would definitely recommend doing so. I feel so much more motivated to put my planner to good use when I like the way it looks! I haven't purchased a single binder since going to college. I don't get handouts too often, other than in a few select classes, but folders are nice to have in case there are handouts or if you have an assignment to turn in. These ones from Target honestly work just fine and they're only a dollar! I remember freshmen year buying 5 separate notebooks (one for each class) and quickly realizing that that was a ridiculous decision. I was constantly bringing to wrong notebook to class and it resulted in my notes being all over the place. Second semester freshmen year, I instead opted for the 5 subject notebook option because it's much more convenient. I've stuck with this option since then because it's much easier. The notebook is definitely bulkier, but I like just having one notebook with a section for each class. If I'm running late, I don't have to worry about grabbing the wrong notebook. 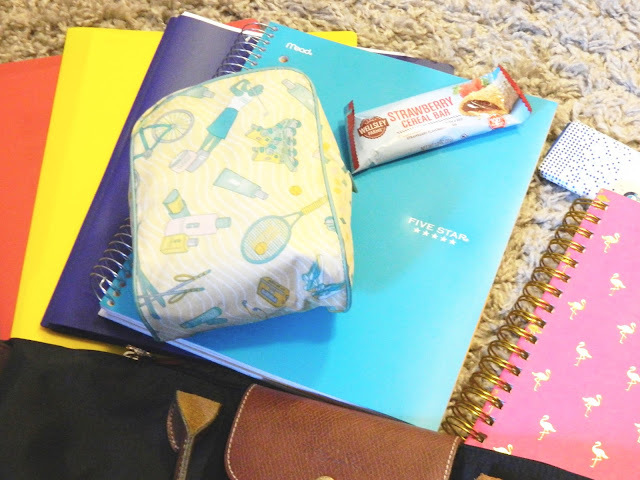 I have one day where I have 3 long classes in a row, so I like to keep a snack on hand. I'm weirdly addicted to these cereal bars, but if you're more of a granola bar type of person these ones are delicious as well! I honestly think chewing gum helps me focus, so I always keep gum on hand. Also, if you find that you get distracted or fidget a lot in class, chewing gum can be helpful for staying focused and keeping you occupied. I recently got this stainless steel water bottle in white and I LOVE it. It claims to keep water cold for 12 hours and believe it or not, it actually does! It's crazy! It's definitely my favorite water bottle to take to class because I'm not exactly a fan of room temperature water. I've been trying to drink more water, and I've found that I'm more apt to drink cold water rather than room temperature or (ew) warm water. 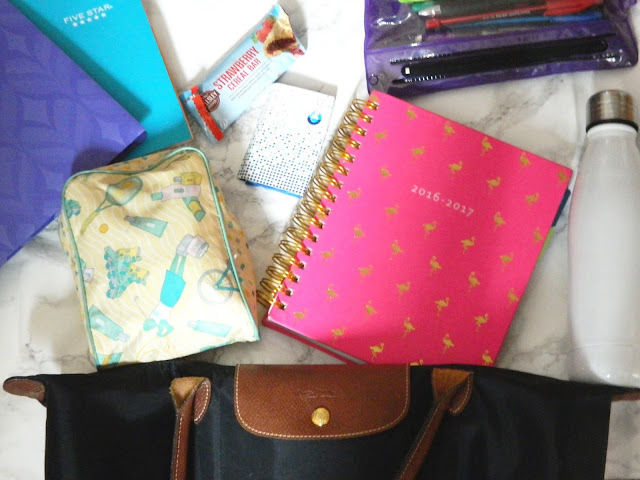 You might be thinking, why does she need her makeup bag for class? I mean, I don't really need the makeup in it for class, but there's a lot of things inside that I do use on a daily basis. 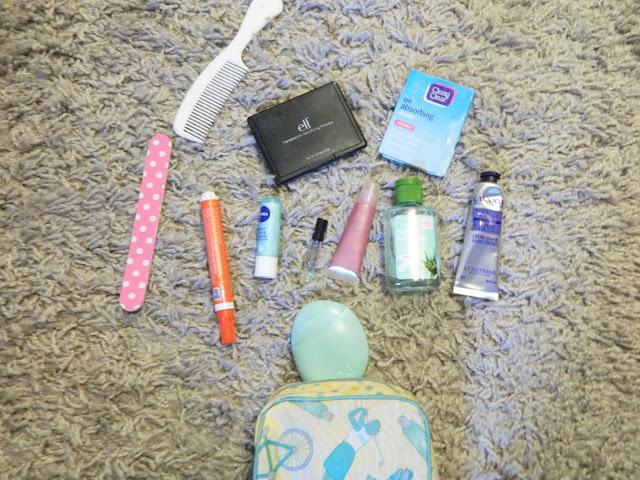 I bring along whatever makeup is in it just because I switch my on-the-go makeup bag between my purse and my schoolbag, so it's just a hassle to remove stuff when I put it in my schoolbag, so everything just stays! This makeup bag is really old (it's from Clinique), but it's the perfect size to fit in all my bags. I feel like it's always nice to have a mattifying powder on hand (you just never know when you're going to feel oily, you know?). This powder is great for touch ups because it comes with a tiny sponge, and the packaging is sleek and small so it fits well in my makeup bag. These oil absorbing sheets can be a lifesaver if you have oily skin! My skin is pretty normal, but it can definitely get oily during the warmer months, so these always come along with me in my makeup bag. They're great to use before touching up with powder if you want to avoid getting the little sponge all gross. A comb is definitely an essential if you're on the go a lot. I find that my hair gets really static-y during the winter, which leads to lots and lots of tangles. It's always good to have a comb on hand just in case, because you never know when you're going to need it! These mini hand sanitizers are great to keep with you because they fit perfectly inside a makeup bag. I'm kind of a freak about my hands being clean, so hand sanitizer is a must for me. I definitely think all college students should have hand sanitizer in their schoolbag. I swear everyone is always sick in college?! I love these mini EOS lotions (are you sensing a trend with all the mini items or?). They smell amazing and I always have one or two in my bag. Again, another great item if you're on the go a lot because of the cute, small packaging! 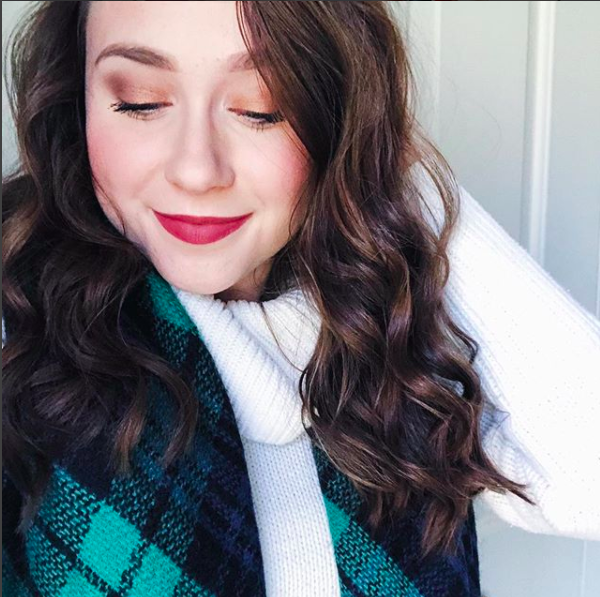 As you might already know, I'm a huge lipstick and lipgloss lover. My lips feel so bare without it and I honestly just need it in my life always. I love this lip balm! If you know me, you probably know that I'm a little OCD about my nails... I like to keep them nicely shaped, so I always like to have a nail file on hand in case theres a hang nail or a break that I need to take care of. I kind of just threw this item in here in case, and let me tell you, it has come in handy more than I ever thought! As you might know, I'm an avid coffee drinker, and I quickly realized that I'm prone to getting coffee all over me, somehow. These things seriously do remove stains and they're perfect for on the go! You never know when you'll need it! Have you ever ordered from Ulta or Sephora and gotten those cute little perfume samples? 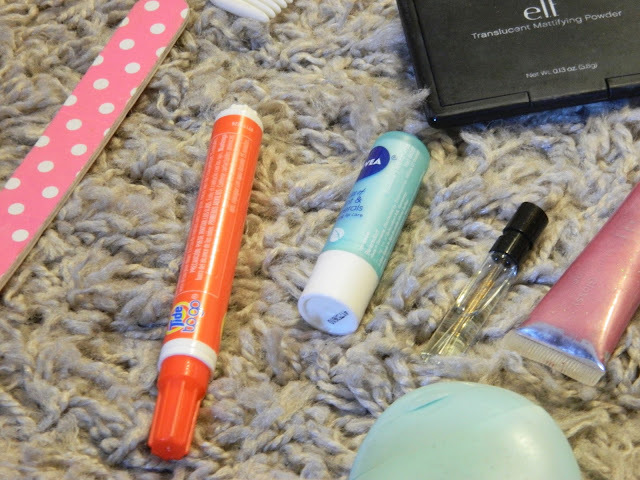 I have accumulated so many of those things and I discovered that they're perfect to keep in your purse! No one wants to carry a huge perfume bottle around, so these are also great to keep with you on the go. 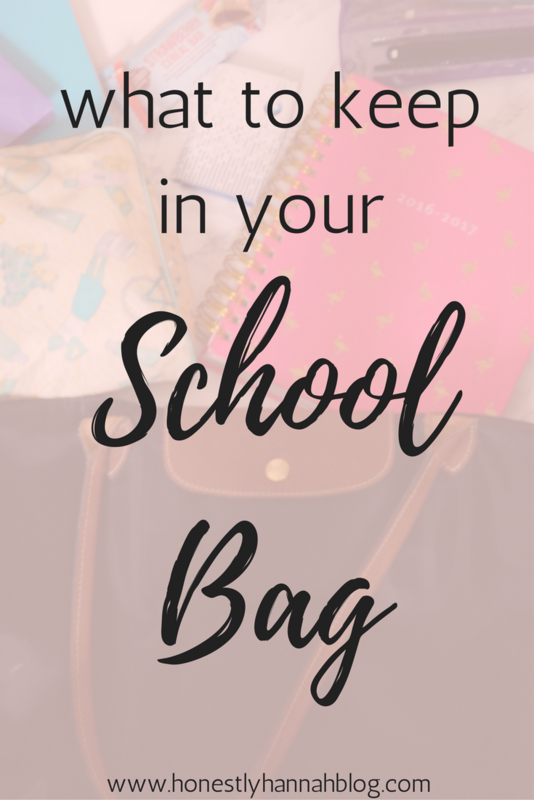 What do you keep in your school bag? I love reading these posts, too! I love your planner, my planner has a flamingo on it, too!! I always keep a Tide to go pen in my bag and a pack of gum...coffee breath is not cute haha. The mini eos lotions are SO CUTE! I have the purple one in my purse, I don't use it often I feel like I keep in in there mostly because it's adorable...not very practical of me haha. I absolutely love your bag! I'll keep mind of it when I'm headed off to college. I have a stainless steel water bottle as well, and it's definitely one of my favorite buys! Thank you Sara! It's my favorite bag :) and my stainless steel water bottle is my baby haha! Do you mean parfume sample on paper? I got one too and kept it in my sling bag. Do you use it like... for everyday to your body? Or is it just to make your wallet smells good? I love how organized you seem to be about everything. I just started carrying bags when I go places, it's actually handy, so this has really helped me get a good idea for when i go to college. Thanks for posting this! Hello! 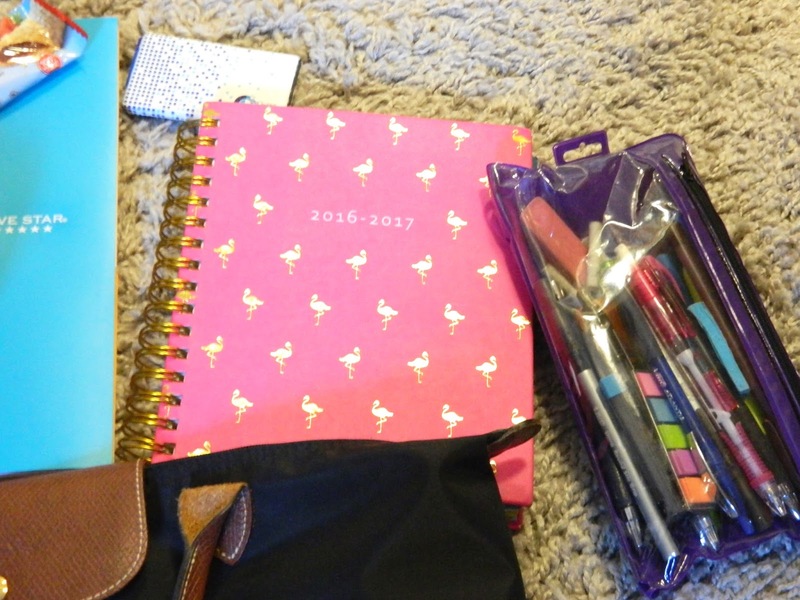 i'm in love with your notebook/makeup bag where did you got them? They are so cute! This post really opened my mind, cause I never thought to bring those things to schoo! Thank you! Could you do some diy galaxy school suplies? Two things that I wish I would have always had with me at school and that is a nail file and a snack! You never know you need it till it's too late! Great post!